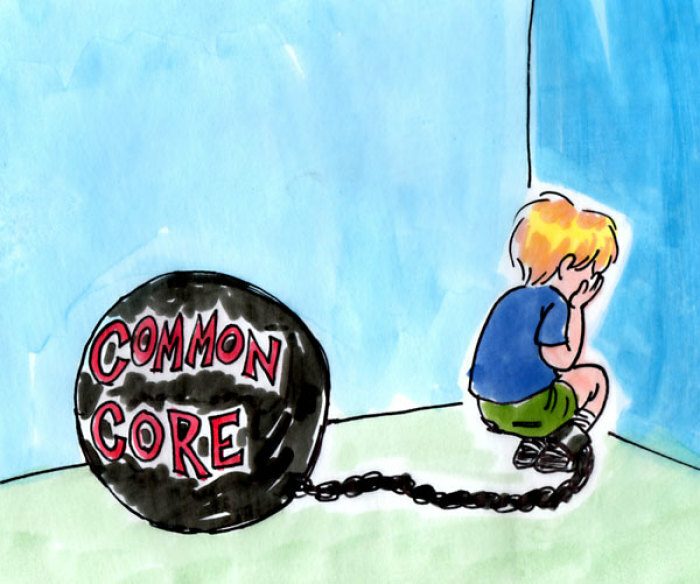 Common Core harms children and will not alleviate poverty because it fails to understand how children learn, a Tuesday report jointly issued by Alliance for Childhood and Defending the Early Years claims. While the Common Core State Standards Initiative expects kindergartners to learn to read, studies have shown that the ability to read in kindergarten does not predict success in later grades, the report states. Additionally, the focus on reading takes time away from methods that have proven successful — namely, play-based and experiential learning. The report was authored by three early childhood education experts: Nancy Carlsson-Paige, professor emerita at Lesley University, Geralyn Bywater McLaughlin, director of DEY, and Joan Almon, co-founder of Alliance for Childhood. "With prompting and support, ask and answer questions about key details in a text." "Read emergent-reader texts with purpose and understanding." "Recognize and name all upper- and lowercase letters of the alphabet." "Associate the long and short sounds with common spellings (graphemes) for the five major vowels." "With prompting and support, identify basic similarities in and differences between two texts on the same topic (e.g., in illustrations, descriptions, or procedures)." "Participate in shared research and writing projects." "Use the most frequently occurring inflections and affixes (e.g., -ed, -s, re-, un-, pre-, -ful, -less) as a clue to the meaning of an unknown word." In the early grades, children learn best through experiential, play-based learning, the report argues. Written language is comprised of abstract symbols representing spoken words. Through play, children learn that symbols represent real things. For examples, the report mentions the creation of mud pies to represent a birthday cake, pretending a wooden block is a phone to call daddy, and drawing a picture of a family. Children also learn oral language through play-based learning, a skill that is foundational for reading, the report states. In a 2013 interview with The Christian Post, Carlsson-Paige explained: "The direct instruction has replaced hands on, active learning and play, which really are the bedrock, or cornerstone activities of early childhood that really solidify learning. Children learn through active engagement and play in the early years. Skilled teachers know how to connect skills appropriately to play as they see what children are doing and where they are on the developmental spectrum." The report cites studies that compared the results of play-based and experiential instruction to direct instruction. One found that almost half of those from low-income families that had direct instruction needed special education for social difficulties compared to only six percent of those who had play-based learning. By age 23, about one-third of the direct instruction learners had an arrest record, compared to only nine percent of the play-based learners. Other studies showed that the children who receive play-based learning in early childhood grades have better reading and math comprehension, and better grades, in later grade-levels. Criticism of Common Core has come from many corners, but debate over the early childhood, K-3, standards has been especially contentious. There were no early childhood experts on the committees that wrote the standards. In 2010, after the Common Core was published, over 500 early childhood experts and professionals signed a statement saying that the standards "conflict with compelling new research in cognitive science, neuroscience, child development, and early childhood education about how young children learn, what they need to learn, and how best to teach them in kindergarten and the early grades." Some have argued that Common Core will help students from low-income families get a better education, and thus help them escape a cycle of poverty. Dr. Carlos Campo, chair of the Alliance for Hispanic Education and leader of education initiatives for the National Hispanic Christian Leadership Conference, made this argument in an op-ed for The Christian Post. "More educational successes lie ahead for our children if we allow these higher [Common Core] standards to have their desired effect — to improve educational outcomes and prepare all of God's children more effectively for college, life, and work," he wrote. The report disputes this notion. The relationship between educational achievement and family income is partly due to school funding disparities, the report points out. With school funding in the United States mostly based upon property taxes and with neighborhoods divided along economic class lines, schools in wealthy neighborhoods (where property values are high) are better funded than schools in poor neighborhoods (where property values are low). In the decade since schools began the high-stakes testing agenda, beginning with No Child Left Behind in the George W. Bush administration, educational inequality had increased, the report states. Teaching reading to young learners is "demoralizing," and "their tools and skills as learners as well as their enthusiasm for learning suffer when the demands are inappropriate," the study concludes. To reverse the current trend, the report made five recommendations: 1) Remove the kindergarten standards from the Common Core. 2) Invest in more and better research on early childhood education. 3) Convene a task force to make recommendations. 4) End all high-stakes testing up to third grade and promote assessments based upon observations of students. 5) Invest in teacher training and development, and place experienced teachers in low-income-neighborhood schools.